imagineNATIVE Film + Media Arts Festival returns to Toronto in October, but the festival is celebrating National Aboriginal History Month this month with several free events. This is a co-presentation of a touring package of contemporary animated films by Canadian Indigenous filmmakers with The Toronto Animated Image Society (TAIS). Titled Welcome to Kanata, this program is curated by Ariel Smith, an award-winning filmmaker and Director of the National Indigenous Arts Coalition, and features 12 dazzling short films, including The Jingle Dress, Canned Meat – The Whole Damn Can, Spirit of The Bluebird, The Visit, Death by Vibration, Nodin (Wind), Sloth, Here and There, Two Scoops, Where We Were Not, Part I: Feeling Reserved, Alexus’ Story, Little Thunder, and Amaqqut Nunaat (The Country Of Wolves). 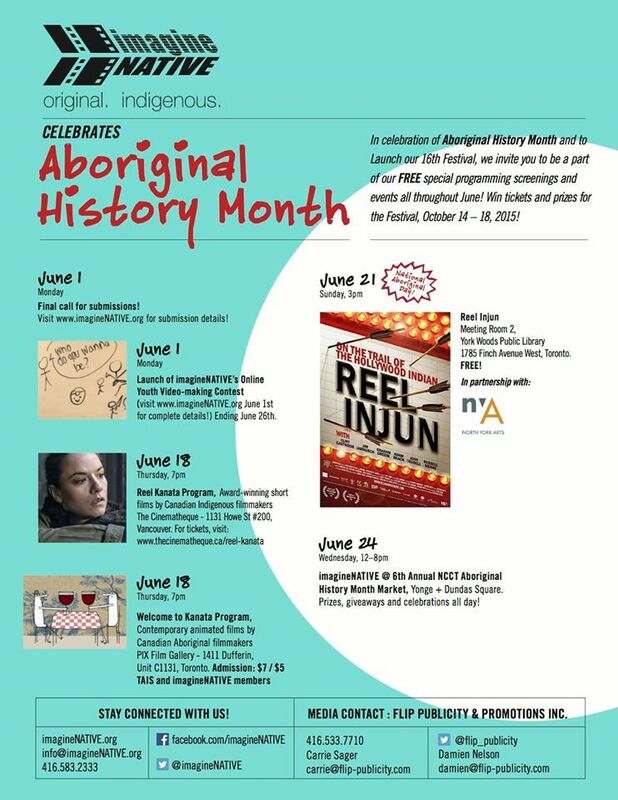 In Partnership with North York Arts, on National Aboriginal Heritage Day, the festival is screening Neil Diamond’s Genie award-winning Reel Injun. This documentary takes an entertaining and insightful look at the Hollywood Indian, exploring the portrayal of North American Natives throughout the history of cinema. Full details can be found here. *I have seen this film a couple of times, and I think it essential viewing. The Toronto Public Library is also hosting a variety of other free events to as part of their Aboriginal Celebration series. The series includes other film screenings, poetry and storytelling. For full details and listings, visit its main website. Festival staff and friends will be welcoming people all day long at YDS with prizes and giveaways, and artists Black Stone, Powwow Dance Bootcamp, Digging Roots, and Métis Fiddler Quartet perform throughout the day.